If your teeth have started to turn yellow or brown, chances are you have been considering whitening your teeth. Now, you have a lot of options to whiten your teeth with the wide availability of over-the-counter whitening products. But, are these products really the best option? There are distinct differences between the whitening products you buy at a local store and the treatments available from your dentist. Dr. Joshua Holcomb offers teeth whitening in Collierville. As your dentist, he has the information you need to know about whitening treatments to choose the best option for you. Tooth discoloration is a natural part of aging. However, stains on your teeth can accelerate due to lifestyle habits, like smoking, and the foods and drinks you consume. When your teeth start to become darker, your first temptation is to try over-the-counter products. These products are affordable and convenient. However, these products do not contain professional-grade whitening agents so they will not deeply penetrate the enamel. As a result, only 63% of those who try home whitening products see any improvement. If the teeth do become whiter, the results are minimal and will not last. Not to mention, results are often inconsistent because of uneven distribution of the whitening solutions. There are certain risks involved with at-home whitening products as they do not offer a custom-fit if trays are used. This can lead to irritation to the gums. Not to mention, whitening treatments are not safe for some patients with prior dental problems and not all cases of discoloration will respond to teeth whitening. To achieve any real results, you need professional teeth whitening from your dentist. Those who choose whitening treatments from their dentist report a 82% improvement in their tooth discoloration. Whitening treatments that are available from your dentist contain high-quality, professional-grade whitening agents that are only available to dentists. The safe and effective whitening treatments deeply penetrate the enamel to resolve tough stains. You will see significant improvement in the brightness of your smile after just one appointment. With the right aftercare, your results will last. You will enjoy consistent results as the trays used to apply the whitening agent are custom-made. 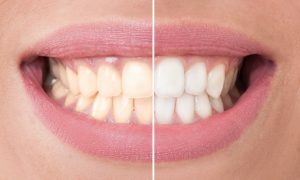 You will not have to worry about irritation to the gums or safety concerns as we are specially trained to offer whitening treatments in our office. We will evaluate the health of your teeth and gums to determine if you are a candidate for teeth whitening. In addition, we will find the underlying cause of your discoloration to determine if the treatments will be effective. Dr. Holcomb is proud to offer cosmetic services in Collierville. Teeth whitening treatments will help you regain a youthful, confident smile using safe and effective treatments. If you are ready to remove dark tooth discoloration, do not waste your money on over-the-counter whitening products. Benefit from the best with your cosmetic dentist. Contact our office today to schedule your appointment for a white, bright smile.